From labels promoting economic and sustainable clothing to a new set of GenNext designers, the Lakme Fashion Week Summer/Resort 2019 is all set to spread glamour with the stalwarts from the industry as well as some new talents showcasing their best designs on the ramp. The opening ceremony was held on Tuesday at the Royal Opera House, Mumbai presented by designer Gaurav Gupta titled ‘The (Un)folding’ which saw Tabu starting the presentation and Karan Johar for the closing. With such a grand opening of the event, it would be very exciting to see what the entire week has to offer. A show at a venue like the Royal Opera House demands a performance. Gaurav Gupta (@gauravguptaofficial) delivered on the theatrics with his opening show for @lakmefashionwk titled ‘The (Un)folding’ which saw Tabu (@tabutiful) starting the presentation and Karan Johar (@karanjohar) closing. As poet Navkirat Sodhi recited live verse, models walked down the runway in structured couture, some glimmering in silks and embellishments, others highlighting the beauty of chikankari. Between gowns, pantsuits and lehenga hybrids the designer ensured there wasn’t a dull moment. 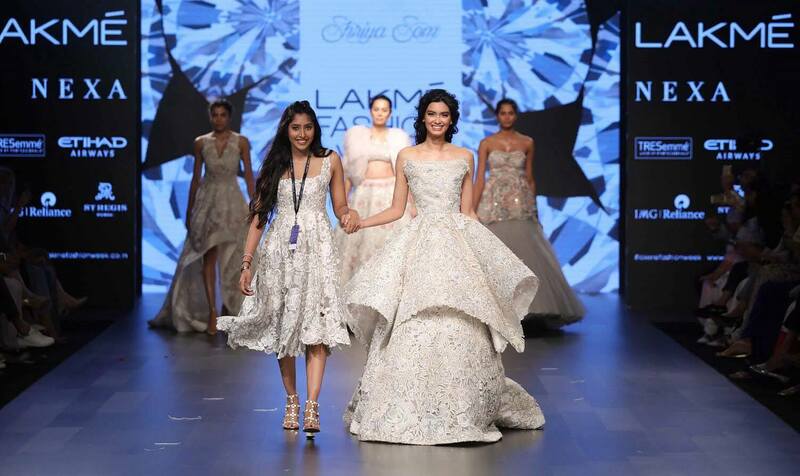 As Gupta completes 15 years in the industry, Sodhi captured his unique creative spirit while talking about “killing pain with couture” through the show. Head to our Instagram Stories for more. Along with the engagements in culturally relevant conversations, this edition has many key points and events to get excited about one of them being the innumerable collaborations that are taking place with a focus on sustainability and handloom. Many designers are set for the game, Anita Dongre has combined forces with Tencel; Rohit Bal will showcase a collection made by the Kashmiri women working at Usha Silai; Reebok will launch a new menswear line with Ruchika Sachdeva’s Bodice; and The Woolmark Company joins hands with Aneeth Arora’s Péro. Vogue had announced India’s first sustainability award, the Circular Design Challenge and the eight designers who had been shortlisted. With several celebrities set to turn showstoppers for these designers, we have Shantanu and Nikhil Mehra’s couture collection, to be showcased at the finale for which the Lakme’s favorite Kareena Kapoor who is said to be showstopping. Here is the list of designers that are lined up with surprises for the Lakmé Fashion Week summer/resort 2019. Couturiers Shantanu & Nikhil (@shantanunikhil) give Vogue a sneak peek to their summer/resort 2019 collection, Recruit, that they will be showcasing at the Lakmé Fashion Week (@lakmefashionwk) finale. The line introduces mens tailoring for women through sherwanis and intricately embroidered bandhgalas—that took upto three weeks to make—styled with exaggerated skirts. Elements like tape detailing and military-inspired brooches on velvet shrugs add a sporty touch. The collection, in shades of red, gold and black, takes inspiration from Lakmé’s new range of matte lipsticks.